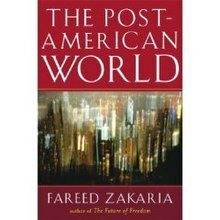 I found The Post American World” by Fareed Zakaria to be a very good read. It’s a good place to start learning about issues with India, China, and North America. The tone is very much of the “chill out” it’s not as bad as you think variety. This was nice to hear, but also probably what I wanted to hear. I’m totally out of my depth to decide if his ideas are good or bad, but I really resonated with the “back story”; his experience of moving to America to study and eventually live there. This discussion was what made the book for me. I listened the audio version and it is well read. This is part of my “Getting up to speed on China” reading project. Last year I decided I should read Kissinger‘s On China, Niall Ferguson‘s Civilization: The West and the Rest, and Fareed Zakaria‘s The Post American World after seeing them advertised in the Munk Debates – China. I’m slowly making my way through Niall Ferguson’s Civilization.